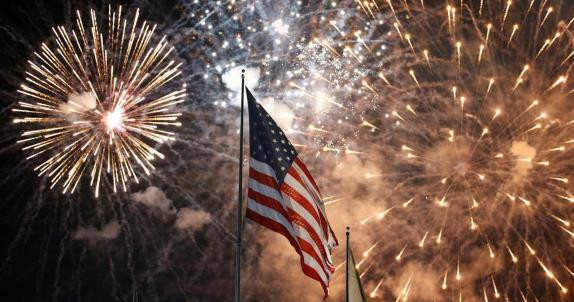 The feeling was tangible at the dawn of Independence Day – something had changed in America. Of course the sun looked the same and the millions of individuals across the country preparing for Fourth of July parades likely didn’t sense anything different from what they experience every year -- yet the air was still fresh with optimism. For July 4, 2017 was the first Independence Day under the national leadership of Donald Trump, a man who campaigned on the promise of making America Great Again. Perhaps fittingly, the president’s early morning tweet echoed the theme. Travis J. Tritten of the Washington Examiner reported, “President Trump sent out a tweet Tuesday morning calling for a happy Fourth of July and showcasing an orchestral version of his top campaign slogan. As I viewed the brief presentation I surmised such an obvious demonstration of unabashed patriotism would never have occurred if Hillary Clinton had won last November’s election. If she were president, instead of featuring an ensemble of Americans singing in front of a giant American flag, Hillary’s Independence Day message certainly would have paid tribute to her non-deplorables supporters and ruminated about how America had deprived them of some sort of human-derived right, likely with a rainbow flag to accentuate the scene. Completing the scenario, Chuck Schumer would stand next to Hillary and cry as a stage full of Muslim refugees shuffled nervously nearby. The Democrat leaders would drone on about relaxing immigration restrictions and opening up the entire world to the promise of America (just like they’ve done in Europe). But thankfully it didn’t happen that way. While it could be argued Donald Trump’s ascendancy to the presidency hasn’t yet fulfilled his promise to Make America Great Again, at least we have a darn good start. With Republican majorities in both houses of Congress and Justice Neil Gorsuch safely seated on the Supreme Court the way is open for conservative policies to begin reversing the damage caused by eight years of Obama’s socialist rule – if GOP leaders would only seize the opportunity. Speaking on the greatness and meaning of the Declaration of Independence, Economist Larry Kudlow wrote in National Review, “Taking these statements together, we see a pecking order. There is God, a higher power or Nature’s God, who grants us the unalienable rights of life, liberty, and the pursuit of happiness. And whatever government is formed around this works for the people. And if the government lacks the consent of the people, there must be great change. “From the Lord, to us, and then to government. That’s precisely what transpired with Donald Trump’s election – government was replaced -- though it was done peacefully under the auspices of the Constitution. Simply put, Americans had become fed up with the Democrats’ politics of division and favoritism and decided an alternative was in order. Government of the few became government of the many. 2016 demonstrated that a man who had never held elected office on any level could come in with a message and a determination to shake up the system and win. The ruling class elites are still licking their wounds because of it. Their shock and lack of acceptance is exposed every time a Democrat or #NeverTrumper gripes about one of Trump’s tweets or his non-stop skirmish with the media. American politics will never be the same after Trump. Liberals are fond of saying Hillary Clinton would have shattered the “glass ceiling” if she’d prevailed in the election but Donald Trump was the one who truly did something unique. Trump disproved many of the preconceived notions about popular American politics: you don’t need gobs of money from special interests to drive your message or the advice of highly paid expert “consultants” or even the backing of the Washington establishment to run the table and beat your opponents. You don’t even require the unwavering admiration of a political party to win its nomination. All one needs to do is love America and believe in not only its institutions, but also its greatness and exceptionalism. Being a billionaire who can fund your own campaign certainly doesn’t hurt, but all that’s really demanded of a determined citizen is to possess an extremely thick skin and an iron resolve to win and do good things for the country. Taking on the status quo is never easy and often bloody. The Founding Fathers understood they were doing something historic and groundbreaking in challenging the greatest power since the Roman Empire with little more than rhetoric, tenacity and tens of thousands of people willing to lay down their lives for an idea. They won…with a lot of help from another great power, France. In all of this it’s not to claim Donald Trump has proven to be a political “savior” or anything of the sort. Trump is a great man but he doesn’t rise to the level of the Founding Fathers. He’s gambled his fortune, his reputation and in some senses his family but he didn’t risk his life to become president. Those qualities are reserved for those stalwart men 241 years ago and for the millions who have come after, imperiling everything they own to don the uniform of the United States military. When the bullets fly there is no “me” nor “I”. A few ounces of pewter or metal know no identities nor does it worry about how much damage is inflicted when it strikes a target. Today, thankfully, the political conflict is not a military one. We should all be grateful. The days ahead will certainly be racked with discord too. There’s the continuing debate over what to do about Obamacare; some sort of tax reform is also (hopefully) in the works. And then there’s the battle over immigration, a fight the Founding Fathers couldn’t have anticipated all those years ago. W. James Antle III of the Washington Examiner reports, “President Trump may have a chance to break the legislative logjam behind healthcare with a victory on one of his signature issues: immigration. Immigration is a winning issue for Trump. As Antle pointed out, two dozen Democrats went along with passing “Kate’s Law” in the House and moving the legislation through the Senate will pressure red state Democrat senators to speak out on a matter that is certainly a hot potato in their home states. At the same time, it’s hardly surprising Trump has stayed clear of the details and granted leeway to congressional Republican leaders to fill in the blanks of complex legislation. From the beginning of his presidential campaign it was clear Trump preferred to delegate authority to people he trusts along with the expectation that great things need to get done. But in the end Trump has largely come through with his campaign promises. Not everything has gone his way and there is much to be done on just about every item on the conservative agenda. But there’s also a certain comfort in knowing that the giant wheels of the executive branch are being driven by people who have the country’s best interests at heart instead of some favored constituency or campaign contributor. And the People are no longer held hostage to an ideology bent on destroying freedom and liberty as the foundation of the Republic. The Oval Office is now occupied by a man who loves America and its people, military, traditions, laws, institutions and yes, the flag. For that alone is enough to give the United States a new atmosphere, something you could almost feel as the fireworks exploded overhead on the Fourth of July.